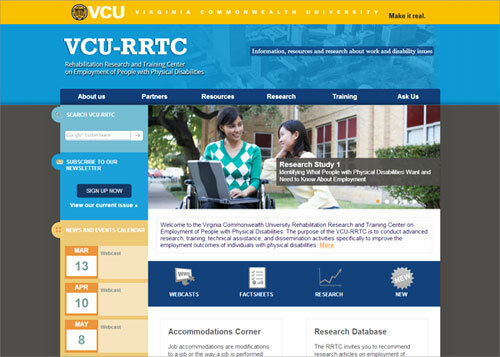 The purpose of the VCU Rehabilitation Research and Training Center (VCU-RRTC) on Employment of People with Physical Disabilities is to conduct advanced research, training, technical assistance, and dissemination activities specifically to improve the employment outcomes of individuals with physical disabilities. Individuals with Multiple Sclerosis (MS) who want to work have options to consider to enable them to be successful on the job. This session will inform participants on how individuals with MS have been and can be effectively accommodated in the workplace. Specifics on if, how, when, and what to disclose if one needs an accommodation will be discussed. Real-life "situations and solutions" from the Job Accommodation Network's (JAN) follow-up study will be presented. Participants will gain valuable knowledge about the potential low cost and high impact of effective job accommodation. You may register for a single webcasts or the series. Individuals with disabilities receive access to all of our webcasts at no charge. People with disabilities should have access to information that is supported by research demonstrating that a practice or strategy is "evidence-based" and effective in supporting employment outcomes. However, what information do people with physical disabilities need? How can research findings be translated into practical information that they can use in their everyday lives? How should this information be disseminated? A review of the literature indicates that there is a growing body of knowledge on barriers to employment for people with physical disabilities and the supports needed to promote employment outcomes. However, it is less certain what people with physical disabilities know about these supports and services that can eliminate the barriers and facilitate employment. programs and interventions for transition-aged youth and young adults with physical disabilities. The new knowledge generated from this research will improve employment outcomes of individuals with physical disabilities in the careers of their choice. It will also enhance rehabilitation professionals and other stakeholders' capacity to provide accommodations and opportunities for these individuals.